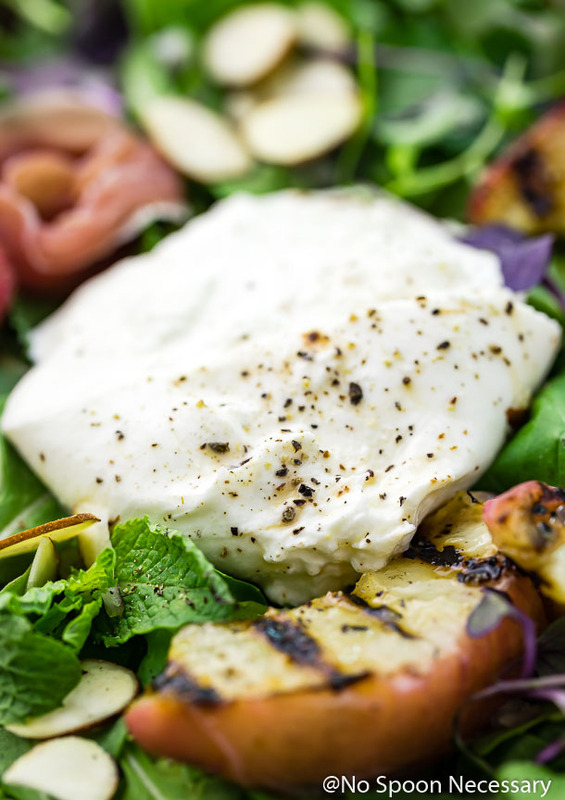 Celebrate summer with this sweet and savory Burrata Grilled Peach Salad! 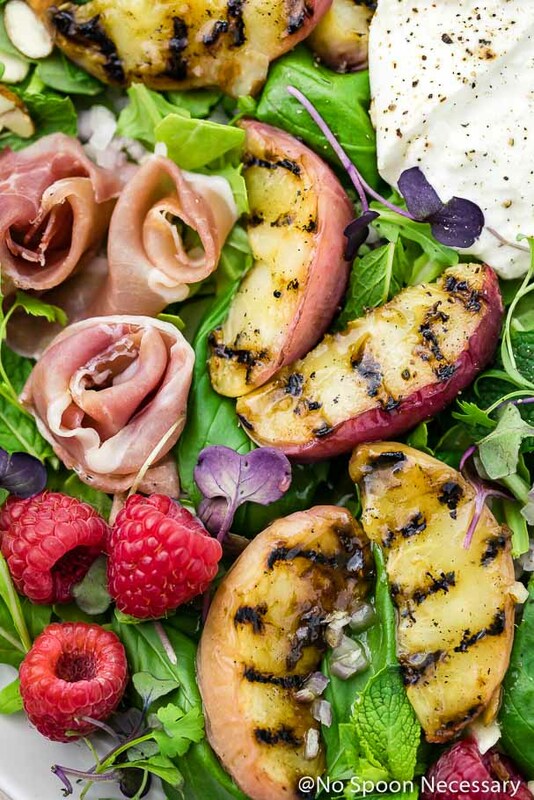 Grilled peaches with sweet raspberries, rich burrata, meaty prosciutto, peppery arugula, crunchy almonds and a silky honey balsamic vinaigrette. 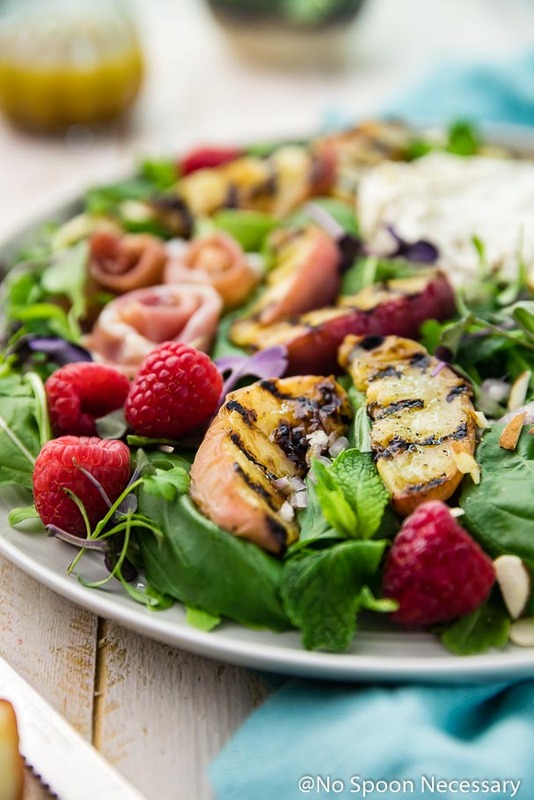 Light, yet satisfying, this fruity salad makes a great side or entree! ⬆️ I always want to say that with a chipper inflection in my voice, but for some reason it invariably comes out more like a question. Even in my head. Anyone else have that problem when it comes to the words happy + Monday? Annnnywho. 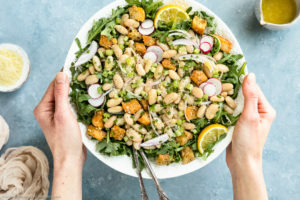 Before we get to today’s recipe, which is some seriously scrumptious salad action, I wanted to address something real quick. I have been having minor issues with this here blog, so if you have been leaving a comment, or paying me a visit super early Monday or Thursday morning for your regularly scheduled posts, and haven’t been seeing it (the comments or the post), do not fret! Your comments are there, and the newest posts are there, but I’m having to clear the cache on my end before things are visible. Layman’s terms – I’m having technical problems over here at NSN*. If you could bear with me, I would GREATLY appreciate it! 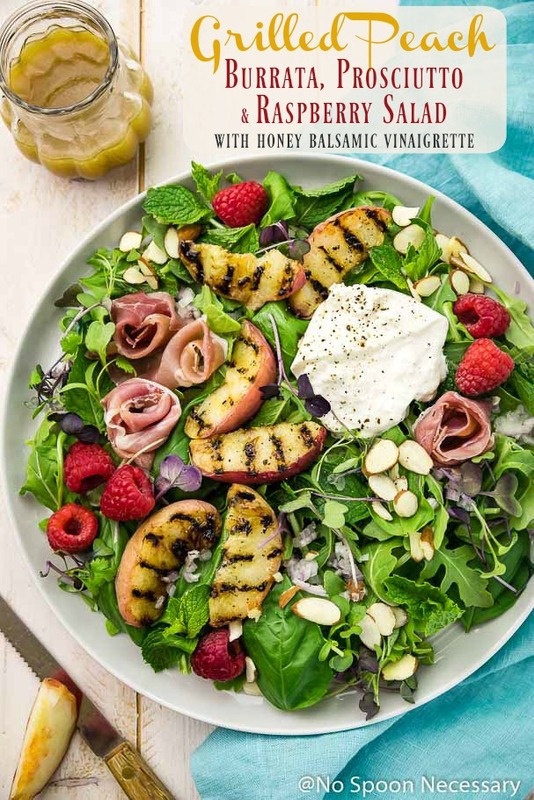 Juicy, plump, smoky charred slices of peaches, pops of sweet, sour raspberries, pungent shallots, fresh mint and aromatic basil tossed with peppery arugula and topped off with creamy, rich burrata, crunchy almonds and salty, meaty prosciutto. 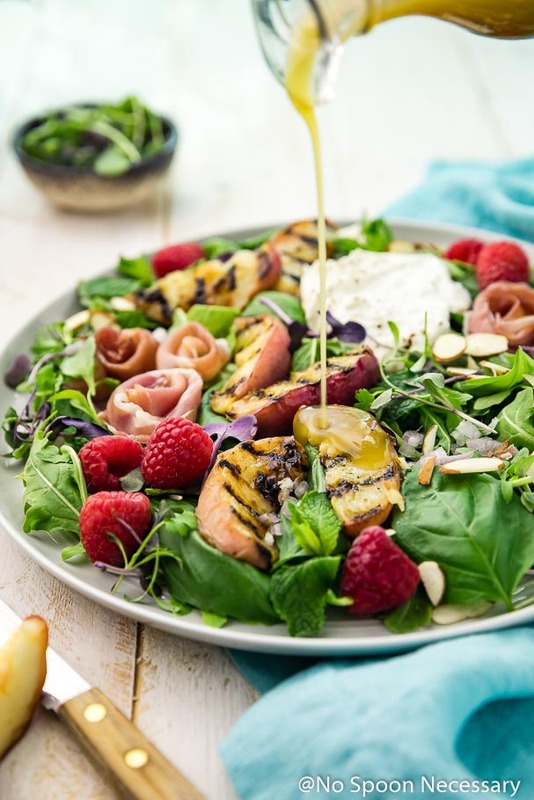 Finish the salad off with a healthy glug of luscious, smooth, tart, silk vinaigrette kissed with a touch of raspberry flavor. 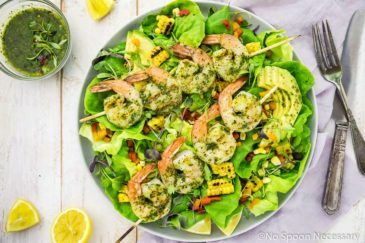 Sweet and savory scrumptious summer salad heavenly noms for your FACE. You can either halve, quarter or slice the peaches before grilling them. It is completely up to you and your personal preference. 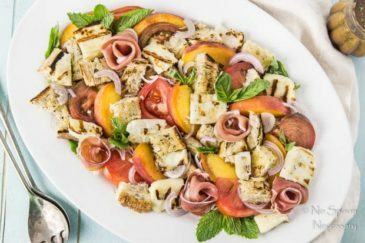 I tend to slice my peaches because it makes for less work when you are hungry and just want to devour this salad. The amount of time needed to grill the peaches will also depend on your personal preference. If you like a deep char, grill the peaches for 5+ minutes on the cut side(s). For a lighter char, grill for about 3-4 minutes on the cut side(s). 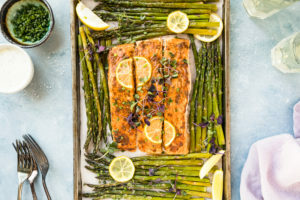 If your peaches are sticking to the grill, use a metal fish spatula to help gently lift and flip (or remove) them from the grill. 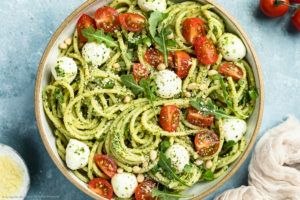 You can use regular balsamic vinegar in the dressing, but I highly recommend using raspberry flavored balsamic if you have it or can find it. I use this one. The raspberry kissed vinegar does wonders for the dressing! 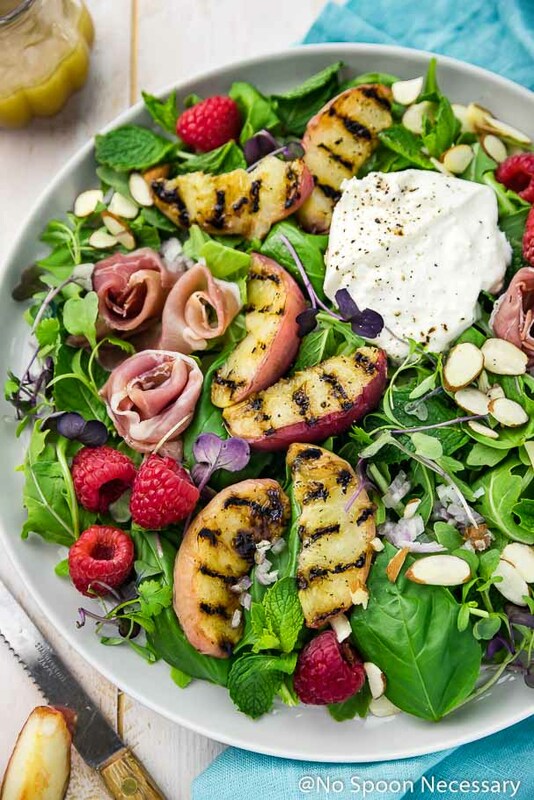 I suggest using arugula as the greens in this Burrata Grilled Peach Salad, because their spicy, peppery flavor mesh well with the fruit, burrata and prosciutto. However, you can absolutely substitute mixed baby greens, watercress or radicchio if you would like. 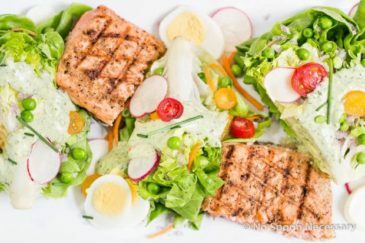 I eat this salad as an entree, but it would also make a great side. The recipe as written below will yield 2 entree sized salads, or 4 side salads. 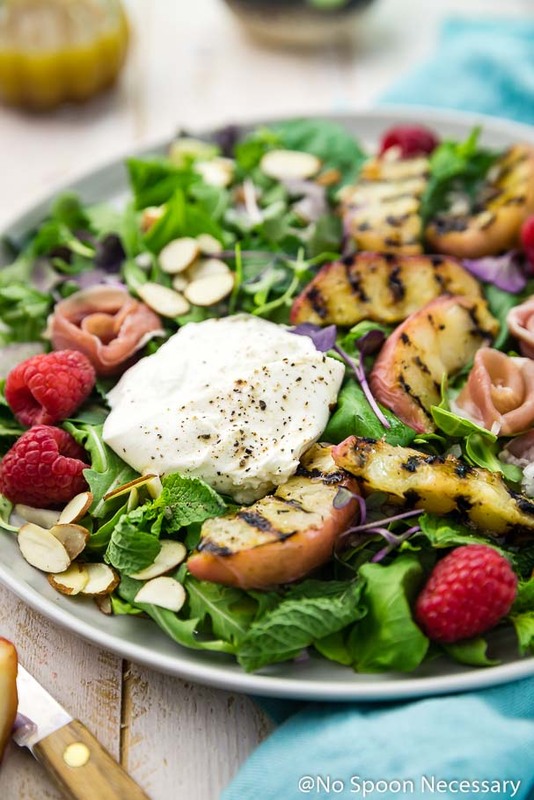 Fresh, fabulous and full of flavor, this Burrata Grilled Peach Salad is light and healthy with a touch of decadence. 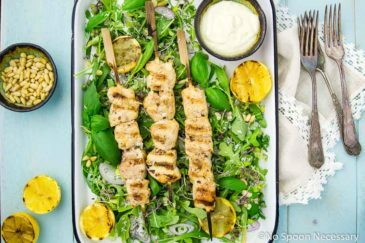 Get this seriously satisfying summer salad in your life. Pinkie promise even the meat and potato enthusiasts will love this! Until Thursday, friends, cheers – to stellar salads. 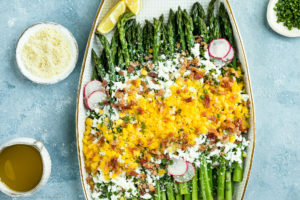 Celebrate the last days of summer with this sweet and savory salad! 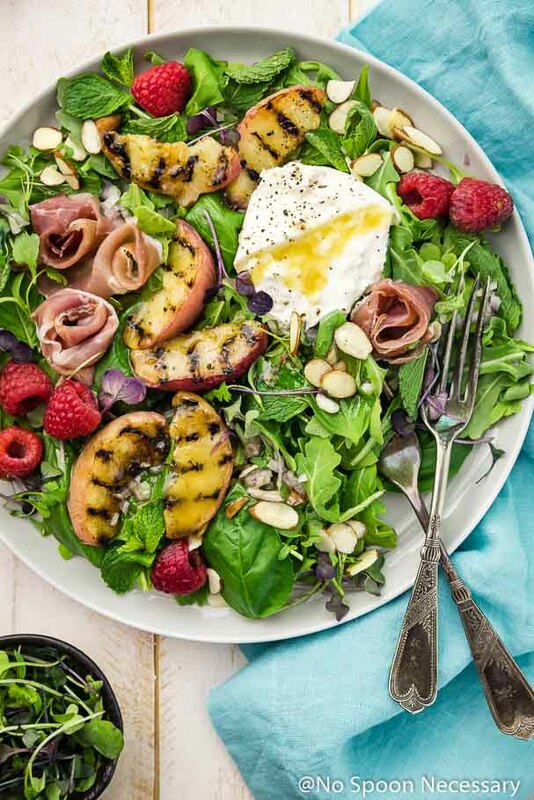 Grilled peaches with sweet raspberries, rich burrata, meaty prosciutto, peppery arugula, crunchy almonds and a silky honey balsamic vinaigrette. 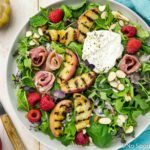 Light, yet satisfying, this fruity salad makes a great side or entree! Make the vinaigrette: In a bowl with a whisk, or in a jar with a tight fitting lid, combine all the ingredients. Season with salt and pepper to taste. Whisk well or shake vigorously, respectively. Taste and adjust for seasoning. Set aside. Heat an outdoor grill, or indoor grill pan, to medium. Brush the cut halves of peaches lightly with olive oil, then place on grill cut-side down. Grill until soft and slightly charred. * Remove from grill and set aside. In a large bowl toss together the shallots, arugula and herbs. Season with ¼ teaspoon sea salt and 1/8 teaspoon pepper. Drizzle with ½ of the vinaigrette and toss to lightly coat. 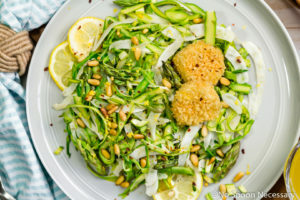 To serve: Transfer the dressed greens to serving plates. Divide raspberries, burrata and prosciutto among plates. Top with peaches and optional garnishes. 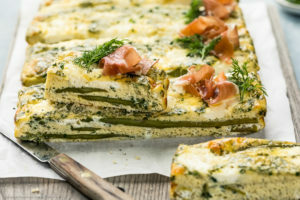 Serve with remaining dressing on the side. Enjoy! 1. You can either halve, quarter or slice the peaches before grilling them. It is completely up to you and your personal preference. I tend to slice my peaches because it makes the salad easier to eat. 2. The amount of time needed to grill the peaches will also depend on your personal preference. If you like a deep char, grill the peaches for 5+ minutes on the cut side(s). For a lighter char, grill for about 3-4 minutes on the cut side(s). 3. If your peaches are sticking to the grill, use a metal fish spatula to help gently lift and flip (or remove) them from the grill. 4. You can use regular balsamic vinegar in the dressing, but I highly recommend using raspberry flavored balsamic if you have it or can find it.